The Blairs are appointed missionaries to Slovenia. As the only AGWM missionaries in Slovenia, they are partnering with the national Pentecostal church to inspire church development and revitalization by engaging the secularist. Togeter they can begin to reach a country that struggles with alcoholism and depression, along with reaching out to the marginalized people groups living in Slovenia. Dan grew up in Ohio, and Abigail grew up in Hungary as a missionary kid. They met at Continental Theological Seminary in Brussels, Belgium where they both earned their Bachelors degree. Dan has his BA in Misisons and Abigail has her BA in Christian Education. They have two children, Aidan and Jocelyn. Dan previously served as a youth pastor within the Peninsular Florida District and Abigail as a kindergarten teacher. They feel called to reach Slovenia by living out the love of Christ one relationship at a time. Many people think of Europe as a beautiful, culturally rich, and liturgical continent, however at the heart of it, Europe is a continent in need of a revival, and the understanding of a personal relationship with Jesus. With the recent refugee crisis, which has affected Slovenia and many other European countries, the gospel has never been more relevant. They are excited to witness what God has in store for the people of Slovenia! Through Jesus' there is Hope for Slovenia! Saint Patrick's name is well-known throughout the western world, but his legacy is often overshadowed by the many traditions associated with the holiday bearing his name. We as a family have Irish roots on both sides, so we have shamrock shakes, wear green and try to eat something "Irish" on March 17th of each year. However, on closer inspection, there is much more to the man behind the "green". 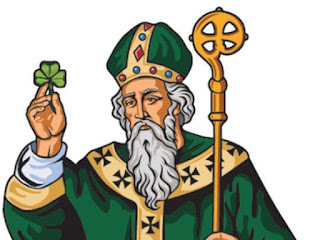 Saint Patrick was born into a Christian family, however he was not a believer himself. When he was 16 years old, he was kidnapped by Irish pirates, and taken to Ireland as a slave. He worked as a shepherd for 6 years, during which time he prayed, and encountered God, eventually giving his life to Him. As Saint Patrick recalls the story, in a vision God told him to escape, and that his ship was waiting for him. He ran away, and managed to get to a dock, where he was granted voyage on a ship. He made his way back home, where he began studies to be a priest. He had a vision, which prompted him to return to Ireland - to the same people who had kidnapped him years ago - and share the Gospel of Christ with them. And he obeyed. And so, he became a missionary to the people who enslaved him. He refused payments for baptisms. He reached the wealthy as well as the poor. He refused gifts from kings, so that he could not be persuaded by man. He was beaten and put in chains for his beliefs. Legend has it, that he used a three-leafed clover to explain the Trinity to the Irish. What an amazing testimony of God's redemptive love! So today, let us meditate on the words of the prayer attributed to Saint Patrick. May Christ be seen in all that we do and say. May Christ be seen in how we treat others. There is no testimony in treating kind people kindly in return. The real power is in reaching out in love to those who we don't understand, don't agree with, and those who even hurt us. Let us remember to ACTIVELY love those who hate us, or stand in stark contrast with us. Abigail was very excited to be a part of the Christmas program for our church! 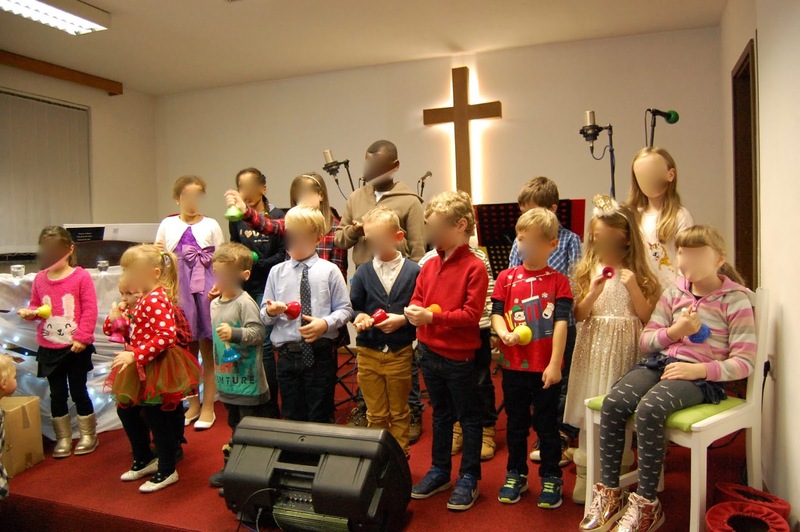 She sang in the choir, and led the kids' ministry bell choir, which debuted at our Christmas service. It was a huge success, and everyone loved seeing their children perform something new, so well! Dan continues to be a part of the country's leadership team for the Young Adult Ministries. They are in the process of planning the Winter camp, and have had a number of worship nights. Dan has greatly enjoyed getting to know some of the pastors better - in fact, he and a pastor friend will be attending a symposium in Spain next month, hosted by the Assemblies of God, about reaching secular people. 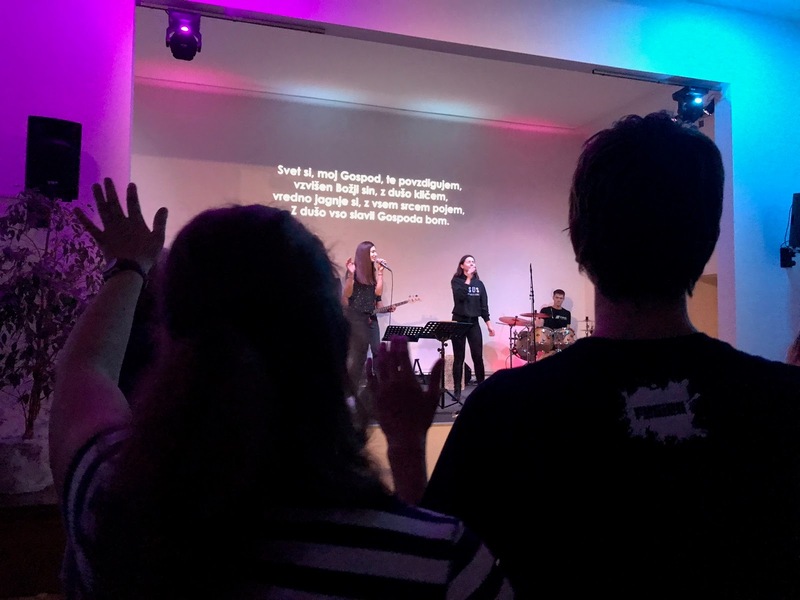 We are thrilled to be a part of the ministry towards the youth of Slovenia! Our church in Ljubljana is a host site for Bethany Global University interns. We currently have 6 students taking part in the training. Our pastor asked us to help them find some areas of ministry. 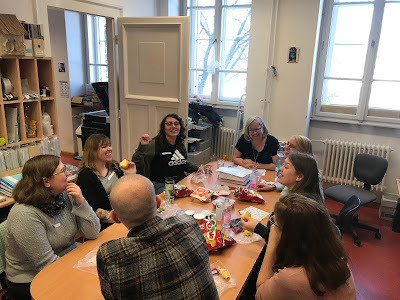 Abigail's mom, fellow missionary Jocelyn Gracza has taught English at one of the Hungarian high schools in Budapest (actually, the school where Abigail and her brothers attended), and was able to have the interns go and facilitate conversational English lessons. Dan even ended up substitute teaching for one of Abigail's former teachers! We were so glad to be able to strengthen the relationship with this high school, as well as help the Bethany students fulfill some of their academic requirements. We have loved getting to know our friends from church, as well as from our son's school. God has blessed us with exceptional people, who we are blessed to live in fellowship with. We spent Thanksgiving with a family from church, have had cookie decorating parties, baby showers and play dates. At Christmas time, we once again baked cookies and delivered them to our neighbors. Through this we've gotten to know our one neighbor and her dog, another neighbor had cookies for us too, and we have a mommy-baby walk planned. Najlepša hvala, thank you so much for your love and support! We couldn't do any of these things, if it weren't for your prayers, encouragement and partnership! As always, we appreciate you more than you know!